Kyle’s career path took quite a few different turns before arriving in his current role as the Apprenticeship Program Leader for Veriha Trucking. Kyle, 33 was born in LaCrosse, WI. He spent his high school years in Alma Center, WI. 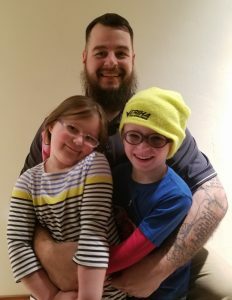 After leaving the military, he dabbled in a career in the medical field as respiratory therapist, though ultimately it wasn’t the right fit for him. “I loved learning” he said but didn’t like working in the hospital environment at all. From there, he dug into a 5 year stint in the mining industry. “Loading rail cars, moving trains, in the actual pit. I had a blast.” But ultimately when the oil industry took a turn, he took that opportunity to move on and decided to learn how to drive a truck. He “picked a company with good on-the-job training, that fit me and my family. I got my CDL in 2 weeks, got my own truck and away I went for the next year”. 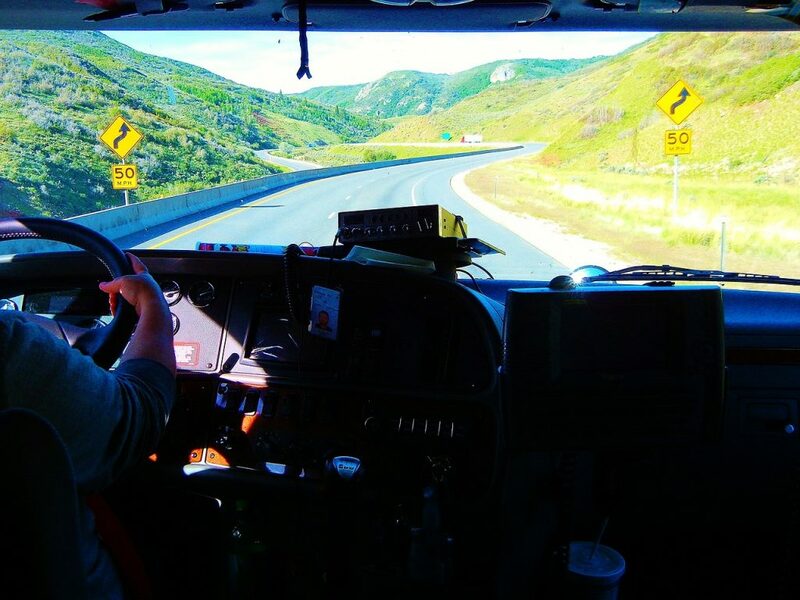 Kyle noted that being an over-the-road truck driver gave him a great opportunity to see more of the United States. Driving through Tennessee was a route that he really enjoyed. Up to that point, he said he’d been in more different countries than states. Being away from home for long stretches no longer best fit his family’s needs, and he looked for a new job that kept him closer to home. He found an opening at Veriha Trucking as a Yard Spotter and joined the team there 2 years ago. From the yard, he moved on to being a coach in the Safety Department, and then ultimately to his current role as the Apprenticeship Program Leader. He’s been with that program “as part of the startup, from inception to today”. Kyle is married and has twin 5-year old children, a daughter and son, who keep him very busy. Currently, they enjoy residing in northeastern WI. In addition, in his free time, he enjoys fishing, hunting, and woodworking. Veriha Trucking is hiring owner operators and company drivers in the Midwest and Northeast. Edward “Eddie” Dalzell talked his way into his first truck driving job at age 19 in Massachusetts. 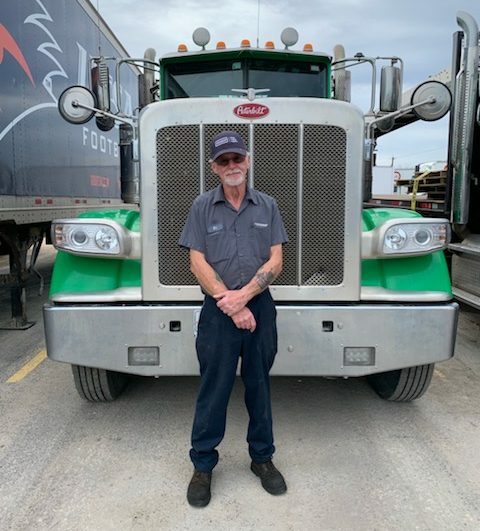 3 million accident-free miles and almost 50 years later, Eddie’s now retired from truck driving but still logging miles on foot as a hiker and lead CSR for Penske in San Antonio. As he tells the story, he got his first truck driving job through good old-fashioned persistence. And telling a little bit of a lie. From there, he had a friend teach him how to drive a truck. Once he got his start with that first job in Massachusetts, Eddie moved south after a few years. There he got his first job as a tanker truck driver. 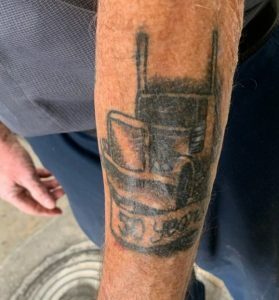 He spent the next few decades with various jobs between Texas and Louisiana, driving tankers between refineries and operating other heavy equipment. He mentions that some of those were dangerous jobs, and that thankfully he got lucky a few times. Living and working near the Gulf of Mexico, he saw his share of hurricanes and severe weather. When asked about his time as a truck driver at Dupre Logistics, he said that they were big on safety, and provided great training. He also fondly recalls having a great boss who became a life-long friend to this day. 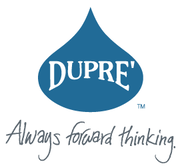 “At Dupre, Leadership was very good. We had good drivers. We could laugh and have fun. They are VERY fair. They also gave a nice safety bonus every 3 months which was nice”. That bonus came with a safety meeting at a great local steakhouse. Eddie mentioned he never missed a bonus, or the steak dinners. Working for Dupre, he said that integrity was important. Over the years, he also spent time as a driving instructor and unofficial career and life coach. Now retired from driving, Eddie spends his days working as a hiker and lead Customer Service Representative for Penske. He says he logs over 52 miles a week on foot, 20,000 steps, walking around the facility. Quite a change from all of the hours and miles behind the wheel! Eddie, 68, has a wife, 6 children and 10 grandkids. In his free time, he enjoys living close to 3 of those grandkids. “I get to see them all the time. Grandma loves to keep them on the weekends – gives their moms a break”. 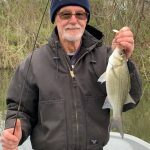 He also enjoys fishing and keeping fit and active. A truck driver’s quick thinking recently prevented a collision with a school bus. The near-accident occurred in Topeka, Kan., when the school bus entered the path of an oncoming truck driven by Delbert Henson. 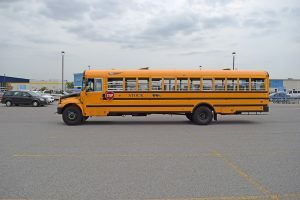 Fortunately for the 22 children and school bus driver, Henson recognized the likelihood of a crash, leading him to hit the brakes hard to swerve. His rig subsequently overturned in a ditch, resulting in minor injuries. No students were injured. Parents are hailing Henson as a hero, reaching out to thank him. “[The students] had some angels watching over them,” said Melissa Bowles, mother of Jaxon, a boy riding the bus that day. A newly proposed bill may allow younger truck drivers to drive across state borders. Currently, federal law prohibits younger truck drivers aged 18-21 from driving outside their licensed state. However, on March 27, California State Representative Duncan Hunter and Indiana State Representative Trey Hollingsworth introduced a new bill. The bill allows younger truck drivers to avoid this three-year limitation. To encourage more young people to pursue driving as a career, the two state representatives believe it is imperative to allow young drivers to cross state borders if needed. They argue that this could address the driver shortage and allow older drivers to retire. It could also help keep costs down for employers by having a larger pool of employees to choose from. This age reduction would come with limits, such as longer chaperoned hours on the road and more on-duty hours before being awarded their new license. However, not everyone remains convinced that adding younger drivers to the pool would provide a positive outcome. Also, some industry leaders believe that allowing young drivers across state lines could lead to higher crash rates and result in catastrophe. A Dupré Logistics driver is being named nothing short of a hero after saving a family of seven. In June of 2017, Fernandez Garner was traveling down I-45 N. He witnessed a large SUV cut off by a tanker, and consequentially, tumble off the road. Garner saw one of the passengers, a little girl, had been thrown from the car to the middle of the highway. He instantly braked and blocked the road to protect her from incoming cars. Then, after examining her for any wounds, he ran down the side of the road to help the rest of the family. Inside the vehicle, he found a boy, two girls, and their mother, frantically reaching for her baby. In addition, the driver, presumably the father, seemed to be injured. Garner moved the children back towards the road. He then calmed the mother down, assuring the safety of her children. For this act of heroism, the Truckload Carriers Association named Garner a Highway Angel. In addition, Dupré Logistics expressed gratitude and pride in Garner for taking such steps to ensure the safety of all drivers. Now that the holiday season is here, more and more vehicles are clogging the nation’s roadways, presenting an even tougher job for truck drivers on the road. Zonar, a producer of smart fleet management technology, has compiled a list of the 10 most dangerous roads you should consider avoiding this time of year – and even the rest the year. During the holiday season, there are about 36% more vehicles on the road, according to Zonar. Most of the increased traffic is made up of passenger cars (23%), delivery fleets (10%), and people-carriers, such as buses (3%), according to Zonar. Winter weather and decreased daylight add to the stress of holiday travel. All this makes it even more dangerous for truck drivers. For more great articles like this and to get matched with jobs that fit your lifestyle, create a free driver profile on our site. The U.S. Dept. of Transportation announced a “Flexible Sleeper Berth Pilot Program”. This allows truckers to split their off-duty sleeper berth time as they choose. According to the The Federal Motor Carrier Safety Administration (FMCSA) notice, 240 participating drivers will be “allowed to use any combination of split sleeper periods, totaling 10 hours.” This replaces the 10-hour block or 8/2 split under current Hours of Service regulations. Using this control group, the agency will gather information from ELDs, monitoring systems like video recorders, and roadside inspections, as well as other tests designed to test the wakefulness of the truck driver, such as wrist actigraphy (a method of monitoring rest/activity cycles) and psychomotor vigilance tests (measures how fast a person reacts to a visual stimulus like a blinking light). Drivers record subjective sleepiness ratings in their sleep logs. Then, the agency uses the information to determine if the change is safe to roll out on a larger scale. In addition, the FMCSA opened the proposal for public comments and many drivers chimed in with support. “Been a driver for over 40 years now. Up until the latest changes, I used those kinds of splits for sleep and or a nap to miss rush hour traffic,” trucker Mark D said of the study. Truck drivers should prepare for an increased presence by law enforcement this week. The Commercial Vehicle Safety Alliance embark upon its annual Operation Safe Driver Week. It combats unsafe driving behaviors by truckers and passenger car drivers. The annual enforcement blitz is scheduled for the week of October 15-21. Officers look for speeding, distracted driving, texting and driving, and seat belt usage. In addition, they monitor following too closely, improper lane changes, failure to obey traffic safety devices, and more. 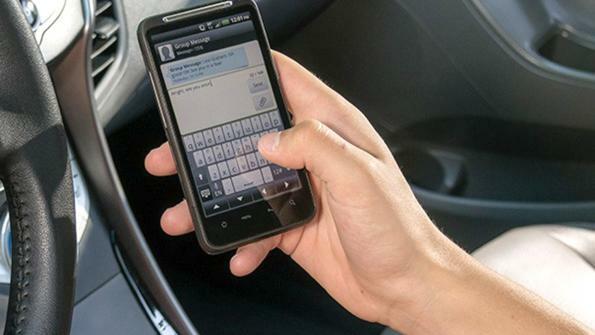 Law enforcement agencies refer to distracted driving as “the DUI of today.” Texting while driving is egregious, taking the driver’s attention off the road. But, you also don’t have to be on the road long to spot someone talking on a handset. 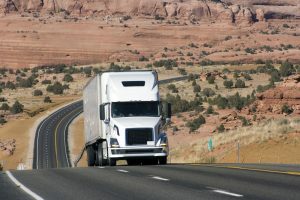 Both are prohibited by state laws in many cases, but they’re also expressly restricted for commercial motor vehicle drivers. 2. Keep your eyes on the road. Smartphones aren’t the only culprit. There are plenty of other things in vehicles today that can take a driver’s attention away from the task at hand — i.e., piloting those several tons (or many more) of steel missile on wheels safely. Who hasn’t laid into the gas pedal now and then when driving along? But, watch your speed particularly during Safe Driver Week. It’s a time of year when road construction is very prevalent, and officers are found paying particular attention to speeders, distracted drivers and so on in construction zones. Aside from staring at a smartphone, the next-quickest tip-off for enforcement officers to pull drivers over will be failure to wear a seat belt. Some believe seat belts lack comfort. However, for many decades, wearing a seat belt saves lives in crashes. Many states have “move over” laws that require drivers to pull away from the closest lane to a stationary police vehicle with flashing lights. Usually tied to the stipulation “if it’s safe to do so.” but if it isn’t safe to switch lanes, these laws may require the driver passing by to slow down considerably. Do your best to give the driver ahead some room. Truck drivers face particular challenges with this since they’re often cut off by passenger vehicles, sometimes by those entering or exiting the highway or maybe a driver who’s just not paying attention. 7. Straighten up and fly right. Signal your lane changes properly, don’t blow traffic lights and stop signs and obey the rest of the traffic signs and devices out there. Officers will be watching for those things during Safe Driver Week. 8. Get the rest of your ducks in a row, too. If an offer cites you or pulls you over, they also check for other violations. Bradley Penneau, a safety program consultant for Telogis, A Verizon Company, commented in a recent Fleet Owner webinar. He stated that a majority of the top commercial vehicle violations are “BLTs.” Meaning, brakes, lights, and tires.